Are you worried your faulty boiler could be dangerous? Having a faulty boiler is no fun at the best of times, but when there’s a possibility of putting it your family at risk, you have every right to be concerned. However, a faulty boiler doesn’t necessarily mean danger. It could just be an inconvenient hassle. A dangerous boiler can kill. However, In many cases, a faulty boiler may just need reset. Most modern, room-sealed boilers have safety precautions such as thermostats, overheat stats, pressure relief valves and oxygen depletion sensors already fitted. So, if something serious is wrong with your boiler, it will most likely cut off and refuse to work. The chances are that if your boiler is still functioning normally whilst making strange noises, it probably won’t be dangerous. However, please be aware if you have an old fire and back boiler, or old floor standing boiler, these can be open-flued appliances. This means they take air from the room they are located in and don’t have the same safety devices. 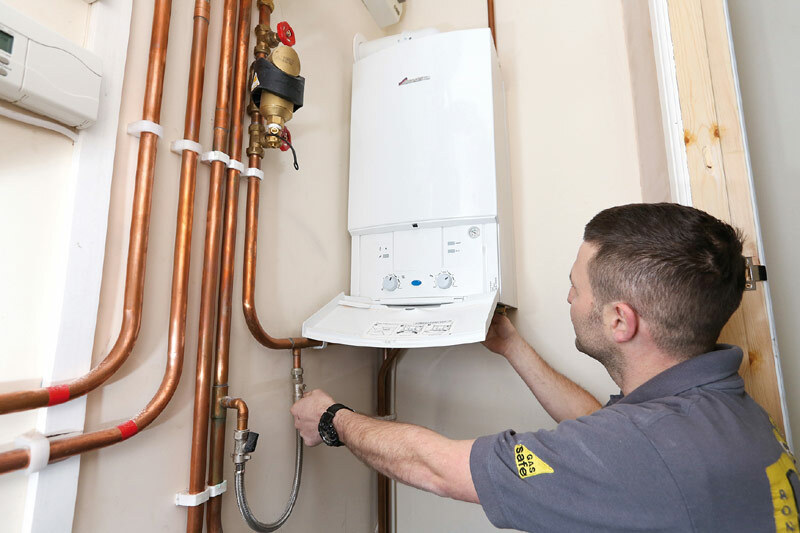 With modern design and the general public’s awareness of gas safety, there is very minimal danger as long as your boiler is serviced annually. Saying that, there ARE some tell-tale signs that your boiler could be dangerous, which I’m going to go over below. The signs below are dangerous and mean your boiler should be switched off IMMEDIATELY. If you are currently experiencing any of these tell-tale signs, or there is ANY DOUBT, call in a professional Gas Safe Registered engineer immediately. Once I was called to a home where the boiler kept cutting out and the owners kept resetting the pilot. The boiler would work for an hour and then cut out again. On inspection the fault was obvious, and entirely due to ignorance and neglect. The boiler was a floor-standing open-flued appliance that took oxygen from the room, and the client had covered the air vent as it had been causing a draft and allowing cold air in. There were black soot marks on the boiler casing. As the boiler could not draw fresh air to burn and draft up the chimney, the boiler started burning a yellow flame instead of blue and spilling carbon monoxide into the room. The yellow flame was wavering under the boiler, and the fumes passing up the casing caused sooty marks. What was happening was when the boiler cut out and the client came in to reset, the door was open with plenty fresh air, so the boiler started. Then all the doors closed and the boiler was starved of air, so it cut out again. The boiler was so old we advised replacing with a high efficiency room-sealed appliance that took oxygen directly from the outside. These problems can be stressful for homeowners – not to mention expensive to repair – but they will NOT put you or your family in danger..
Error codes on modern, room-sealed boilers can be reset, and if they happen again call in an experienced heating engineer. I’d usually recommend this if you need to reset your boiler for the same fault twice. If you have an old boiler with a pilot light that keeps going out, or has to be reset more than three times, I’d also be looking up a heating engineer to come and take a look at it. The dangers of carbon monoxide are very real, so if you are experiencing headaches or nausea, open the window to get some fresh air and call an experienced gas engineer. Read more about the dangers of carbon monoxide on our blog. Remember, NEVER attempt to adjust or alter a gas appliance if you are not qualified. Wrongly serviced or set up gas appliances can kill. If you’re concerned that your faulty boiler is dangerous, it’s better to be safe than sorry. Often, faulty boilers aren’t actually dangerous, especially if you own a modern, room-sealed appliance. However, the signs below are dangerous and mean your boiler should be switched off IMMEDIATELY. If you see any of these signs, do NOT use your boiler and call a Gas Safe registered engineer immediately. You may simply need a repair or a brand new boiler – if the latter and you are worried about the cost, speak to APG Domestics about boilers on finance.